"My life as a Benedictine Sister has found a wide range of expression." My name is Sister Gerard Wald. I work at the University of Mary as Director of the Student Volunteer Program and I am director of vocation ministry at Annunciation Monastery. My position at the University of Mary involves working with students committed to providing community service on and off campus. I get to work with some of the most wonderful people in the world who like to be of service to others. As vocation director, I meet with women who are discerning a call from God to become a sister. I grew up on a farm near Napoleon, ND with four brothers and five sisters. Growing up on a farm and attending a one-room school for eight years provided me with many opportunities to be creative in seeking self-expression. I also attended a country church where the people bonded together as a community. Everyone knew each other and shared in the community's joys and struggles. The deep faith and community experience in my family and parish were the most important influences in my becoming a Benedictine Sister. My life as a Benedictine Sister has found a wide range of expression. I have participated in the community life of the Sisters of Annunciation Monastery since September 1962. I made my final profession on July 11, 1969. The most rewarding aspects being a Benedictine and living in community are: liturgical and personal prayer, sharing in the joys and struggles of other community members and being a part of a group of women who sponsor the works of the church through health care at St. Alexius Medical Center and Garrison Memorial Hospital, and through education at the University of Mary. 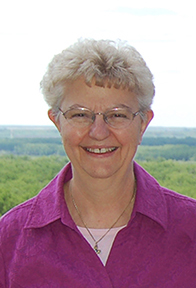 As a member of Annunciation Monastery, I have had an opportunity to work as a printer, nurse, resident director, teacher, advisor, and presently as Director of the Student Volunteer Program at the University of Mary and Vocation Ministry director at Annunciation Monastery. Working at our sponsored institutions has given me the opportunity to be involved in ministries in which I share common goals with my religious community and experience strength in having community support in my ministries. I look on my life as a gift from God for which I am deeply grateful.